When in 2012 I visited Warwick University’s Mead Gallery to see Daniel Sturgis’ selections for The Indiscipline of Painting I was intrigued by a particular canvas; its gossamer two-toned spray paint and crumpled-paper-like folds, suggested three-dimensionality, yet retained a perfectly flat two-dimensional surface. It appeared very simple, yet very beautiful. One year on, at London’s Frieze Art Fair, I found myself admiring an elegant cream woven surface stretched before me on the wall; dynamic threads inter-laced, inter-linked and inter-twined, perfectly weaved, perfectly executed and perfectly brought together the domesticated and the skilled. It was not a surprise when I realised the works were of the same artist. This evening, I am at the ICA for American artist Tauba Auerbach’s first solo exhibition in the UK. The Lower Gallery of the ICA is a sunken floor space of polished concrete. The sheer gauzes that usually mask the outside wall windows have been removed especially for this show so that the electromagnetic rays of light can travel through the gallery, bounce off the white painted walls and be polarised on the other side by Auerbach’s site-specific piece installed on the division between gallery and passageway. Grating is a white painted structure of MDF slats placed vertically upon the division wall and stretching to the ceiling. The idea here being to oscillate waves in the light ray in one direction; anyone looking in on the gallery from the passageway would be able to view the works partially obscured, distanced and from an outsider experience, dependent purely in relation to the angles of viewer and the Grating. This sense of displacement occurs inside the gallery also but is provoked by other means. The play with light and perception is continued in Prism Scan II (Cross Polarized Mesosiderite). A two-dimensional photographic print that passes through three dimensions in the process of making. Auerbach has scanned a photograph of a meteor cross-section through corrugated glass, resulting in an image that appears something like a pixelated television screen. Areas of the image are flipped and mirrored where the light has passed through the ‘periodic structure’ of the corrugated glass. Objects and materiality are twisted and manipulated but it is not always apparent. It is the ‘periodic structure’ of the chameleon painted plinth of S Helix that causes the paint to change colour depending on the viewing angle, because its grate-like structure only allows certain wavelengths to travel at certain angles through it. S Helix is a glass sculpture of a sheered and squashed S helix, the chiral opposite or left-handed to the Z helix. 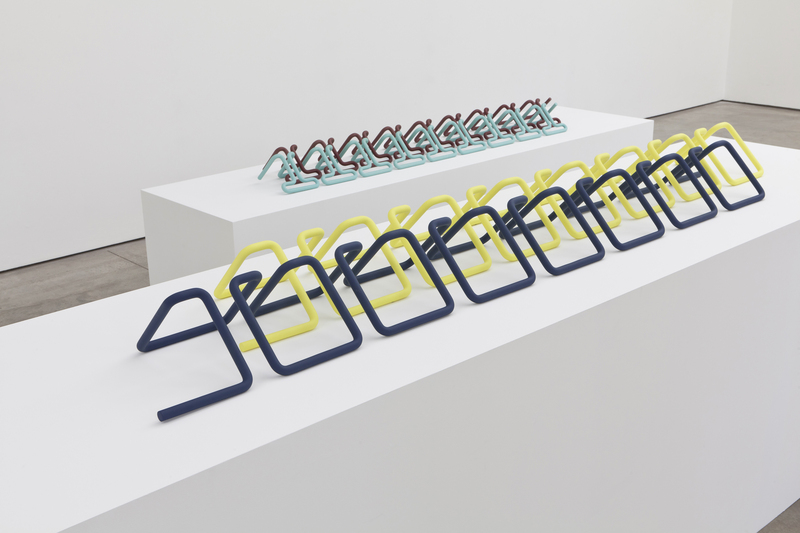 Square Helix (Z), Knit Stitch, and Latch are brightly coloured powder-coated steel sculptures, each comprised of two inter-locking parts, on plinths. The two parts of each appear to be the same, but they have differing forms of symmetry or self-similarity (rotational, translational or mirror symmetric) that affect the way the parts would function. There is a seamless blend of the domestic feminine with the industrial masculine with no overt genderization; thinking less in terms of opposites but in terms of asymmetries, co-existing. The title pieces are The New Ambidextrous Universe III and The New Ambidexterous Universe IV. The former looks as though it has been sliced and re-ordered as though stretched and flipped from diagonal corners, the latter has the appearance of an angelfish. Each has begun as a 4’ x 8’ piece of pine plywood stuck to aluminium. This has then gone through Auerbach’s process of cutting the wood into thin strips along a hand-drawn line, the strips have been re-assembled in reverse order, flipping the grain in the wood. The result is beautiful, strange and puzzling. The spectator is asked to consider how dimensions work, from 0D to 4D, and how objects may move from each space, and how those objects may be viewed. Yet, this is no illustration; it is a full-hearted exploration into the concept of the existence of another dimension that is neither tangible nor visible but that if did not exist we would have to question whether the work before us would have ever been possible.